Head south-east out of Italy’s motorcycle capital of Bologna on the E45 towards the Adriatic Sea and eventually you arrive in Ravenna where you are transported back in time and you haven’t even had to reach 88mph. This was the capital of the Western Roman Empire, it’s where Julius Caesar gathered his forces before crossing the Rubicon and you don’t have to look far to see a Basilica decorated with the world’s most incredible mosaics. But Ravenna is also home to a small workshop that takes you back to a time when great craftsman and artists worked from their small studios to create pieces that would remain on the lips of admirers for centuries to come; this is the home of Oscar Tasso’s OCGarage. 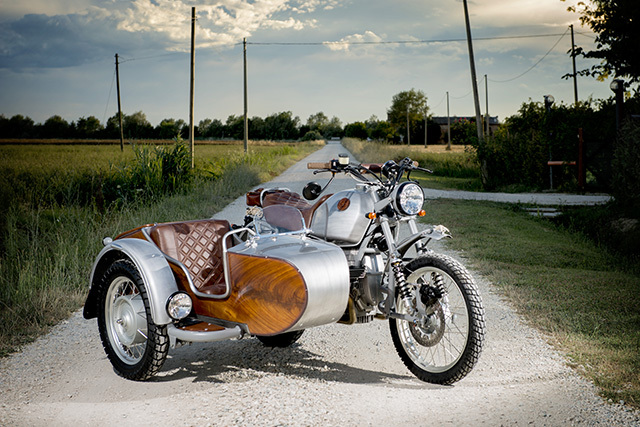 It is here that he has created his latest masterpiece, from the very best materials in the world, a 1992 BMW R100GS with sidecar, it’s the incredible AVVENTURA! 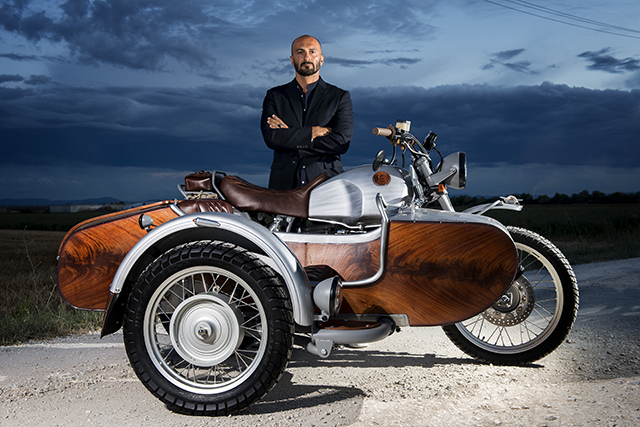 Even in his teenage years Oscar had one definitive goal, to make his passion his career; he worked on engines and then started with cars but his ultimate aim was to build one off custom motorcycles. With an unrelenting passion and tireless work ethic he progressed further in the motorcycle industry, building race bikes and becoming a deft hand at suspension tuning. Now for the last two decades, all the motorcycles Oscar creates have a name and story to tell. “They are the emotion of a moment in life made tangible, moulded in beauty and filled with essence.” Once each is completed they will never be replicated, what is left over is destroyed and their beating heart comes alive “it is right at this moment that technology stops being cold, carries the soul, changes name and becomes ART.” Every OCGarage motorcycle is special, but it’s hard to imagine anything as good as this chariot fit for a King. But that engine would spend a great deal of time on the bench in a corner of the small workshop while the GS was overhauled to become a three-wheeled machine. The frame was stripped of absolutely everything, ground smooth and given a new subframe to compliment the look Oscar was going for. New mounts were added that swing the custom rear fender that was lovingly sculpted by hand to follow the contours of the rear and provide a more vintage look. Bolted to each side is a motocross number plate that while somewhat hidden in body matching paint is a subtle nod to the bikes racing pedigree. While atop the new fender Oscar fabricated custom baggage wracks as well as a simple numberplate holder and brackets for the lighting assembly. The fuel tank is the standard ’92 unit that has been body worked beyond belief, there is no filler or bondo here and Oscar has replaced the badges with his own company’s logo in timber and a one off fuel cap. 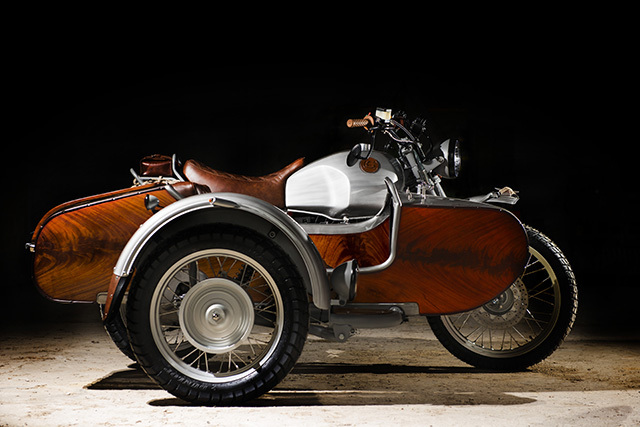 But the timber work really gets serious over on the sidecar, “The surfaces are covered with sheets of precious mahogany” that gives the sides the look of an oversized Stradivarius. 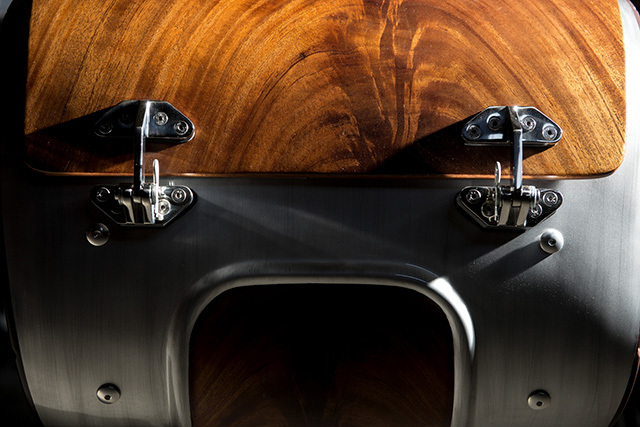 The aluminium bodywork that compliments the wood is just as impressive with each sheet arrow straight and forming the most perfect lines; which were not drawn up, simply envisioned and then created. The framing is designed to match that of the BMW’s and sweeps around the side and with an unbroken line comes up past the body that it supports to create a grab handle in front of the passenger. They ride in style being protected from the wind with a small shield that is affixed to the body with marine grade bracketry. The same high end brackets are used throughout, along with fixtures and fittings you would normally find on a yacht valued in the millions. More Mahogany is used to create the rear hatch that provides ample room for a gentleman to store more than enough for a picnic fit for a Queen. 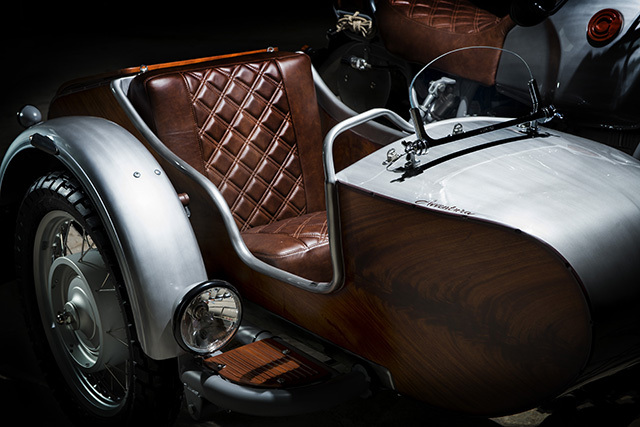 Her Majesty steps into her carriage on a beautiful timber piece that sits in front of the sidecars wheel and waiting to cushion her body is more incredible craftsmanship. The throne, ok I’ll call it a seat, is generously padded before Oscar laid the finest premium grade leather over the top featuring a double stitched diamond pattern in a non-degrading marine material. The sides also feature Mahogany panelling while on the floor and stretching up under the body work is Jaguar X-Type carpet for the most plush of finishes. Should the lady need to write while on the move or use an old map to navigate the door features a tailored leather cover with three pockets for a pen, pencil and sextant. Of course with the GS capable of traversing all sorts of roads a large mudguard was fabricated that provides generous coverage to the sidecars tyre and features a matching leather mudflap. That leather was also used on the beautifully upholstered seat on the bike itself with the same material used to create the small rear luggage and there is a sailing rope thrown in for good measure. To ensure all this comfort could be enjoyed Oscar spent a huge amount of time getting the suspension just right, but it starts with the wheel and tyre combination. All three wheel hubs are constructed from 6082 aircraft grade aviation alloy that result in hidden spokes and the ability to run modern tubeless rubber, in this case from Dunlop. The bikes rear suspension has been upgraded with a fully adjustable Ohlins mono-shock mounted to a revised position on the swingarm with the adjuster mounted to the side of the bike. 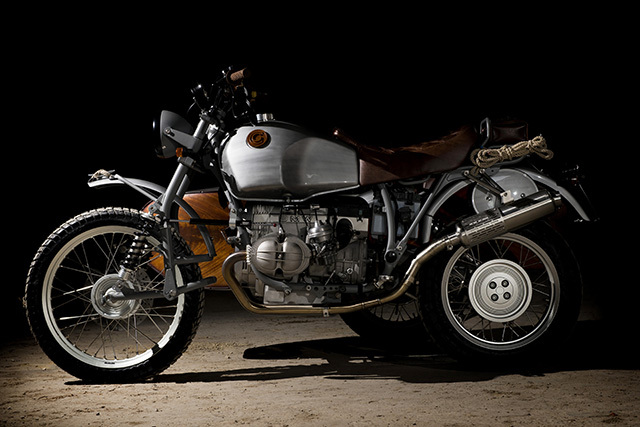 The front of course is not at all how the BMW left the factory, now sporting a Ural like leading link combination. Twin coil-over shocks provide the dampening and are also adjustable with a steering dampener affixed to the main chassis also joining the party and proving pretty handy in a cross wind. The front brake is a combination of a single drilled rotor and lever arm supported caliper, while up on the front fender is a yachting cleat and rope for docking. The buggy itself is also sprung for a plush ride and is attached with rose-mounts that allow for fine tuning of the overall combination. Should a night time ride be required the lighting has been well appointed while remaining unobtrusive to the styling. 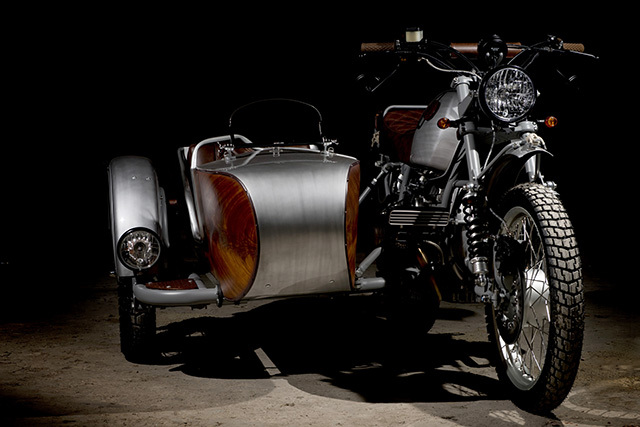 A classic round headlight sits at the front of the BMW and a second item in the forward step of the side car. There are taillights on both bike and buggy, as well as a full array of indicators all-round, with a bullet shaped item neatly hugging the sidecars fender. The final task before everything was reassembled for the final time was to have all the bodywork sprayed in an aluminium effect paint job that gives an incredibly realistic impression of the alloy without the worry of corrosion or discolouration. Words cannot describe the finished result, simply feast with your own eyes, and for Oscar “It was an intense creative process, where many lives and many passions have crossed. It was a pleasure to design and then build AVVENTURA…. now let’s move on!” Because while his client now has an incredible piece of motorcycle art to call his own, Oscar has more creative passion to unleash!